An ENTITLE public event in Istanbul presented what is perhaps the most ambitious essay collection to date on political ecology*. The new Routledge Handbook of Political Ecology (HoPE), edited by Tom Perreault, Gavin Bridge and James McCarthy, has just been published. 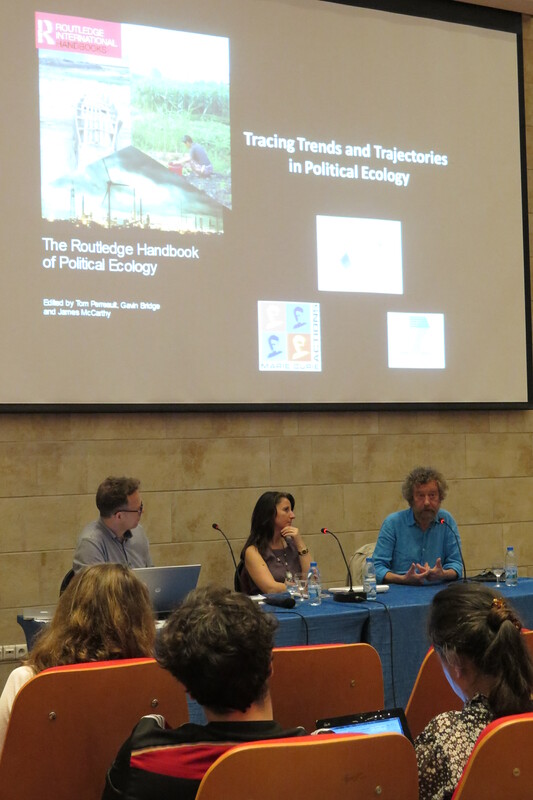 During a Summer School which took place at Boğaziçi University Istanbul last 15-20 June, the ENTITLE Network organised a public launch of the Handbook in an event on New trends and trajectories in Political Ecology. HoPE was introduced by one of its editors, Gavin Bridge, who explained how he was convinced to take part in the editorial team thanks to the ambitiousness and originality of the project—despite initial scepticism regarding the need for ‘yet another political ecology handbook’. His introductory talk was also an opportunity for reflecting on political ecology as a field of inquiry in the present conjuncture. Political ecology is understood as an epistemological project challenging comfortable and simplistic ‘truths’ about relations between society and environment. As the editors state in the Handbook’s concluding chapter, it is a “theoretical and political lens through which to understand, challenge and structure further inquiry into nature-society relations in the contemporary world” (p. 621). The field of political ecology has grown and diversified over time. Today, for Bridge, “it is a capacious intellectual framework—a riotously diverse field in which the meaning of political ecology has expanded rapidly.” Its geographical and institutional development has, however, been uneven. “Political Ecology has become institutionalised in North America in a way that it has not in Europe. There are growing international links and cross-fertilisation—of which, for instance, the ENTITLE project is part—alongside the emergence of distinctive regional traditions of political ecology”. HoPE includes perspectives from outside the Anglo-American tradition of political ecology, such as a chapter by Denis Gautier and Christian Kull on ‘French research traditions on peasant agricultural systems’ (chapter 5) and one by Mexican scholar Enrique Leff on viewing political ecology ‘from the South’ (chapter 4). As the Handbook’s introductory essay explains, these are: a) a theoretical commitment to social theory and post-positivist approaches, in which knowledge about nature is inseparable from social relations of power; b) a methodological commitment to in-depth qualitative research and direct observation (although often in collaboration with/with contributions from quantitative approaches); and c) a normative-political commitment to justice and structural political change; that is, not just to explain, but to construct an alternative understanding with an orientation towards justice. And further, as political ecology is diverse, it raises questions about political ecology’s relations with other fields. HoPE’s editors—Bridge recounts—“make the point that political ecology has no monopoly on socio-natural relations: rather it is one patch in a broad field occupied by other social science disciplines, such as environmental anthropology, environmental sociology, ecological economics, environmental economics and sustainability science”. HoPE is an impressively broad collection—650 pages, comprising 48 chapters by 55 authors. It is structured in four parts (see the table of contents). The largest (part IV)—on ‘Core questions in political ecology—is organised around five fundamental questions: environmental knowledge; environmental change; environmental governance; environmental identities; and environmental politics. The event continued with a presentation by Stefania Barca, author (with Gavin Bridge) of a chapter on ‘Industrialization and environmental change’ (chapter 28); and with a talk by Erik Swyngedouw, author of the last chapter (47) on ‘Urbanization and environmental futures’. These presentations, and the debate that followed, gave the audience a taste of what is perhaps the most ambitious essay collection to date on political ecology. *Many thanks to Gavin Bridge for help in the preparation of this post. i agree that the volume sounds absolutely great in terms of scholarship and praxis . . .
but just to be slightly churlish, at least in the u.s. the book costs $260 and is only available in hardbound edition . . .
which means that even if one has a connection to an institutional library that will purchase the book, one can only request a copy of one chapter from the book . . .
so while i congratulate all the authors, i do not have very friendly feelings toward the publisher . . .
so you will have to do another launch. It is MUCH more international with sections on all sorts of regions and countries. Craig is right – mortals cannot afford these books at the moment. Softback issues needed, and cheaper electronic versions. There is a huge incongruity between the anti-capitalist content of these types of books and the prices charged by commercial publishers. Mine (Engaged Political Ecology, Open Book Publishers, chapters by Dove, Wisner, Goldman etc.) will be about ten pounds I hope and free online!